Der Artikel Vladimir I. Arnold: Vladimir Arnold - Collected Works wurde in den Warenkorb gelegt. 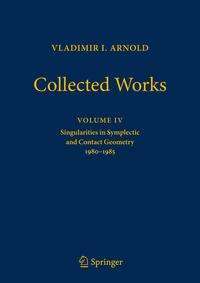 Volume IV of the Collected Works of V. I. Arnold includes papers written mostly during the period from 1980 to 1985. Arnold's work of this period is so multifaceted that it is almost impossible to give a single unifying theme for it. It ranges from properties of integral convex polygons to the large-scale structure of the Universe. Also during this period Arnold wrote eight papers related to magnetic dynamo problems, which were included in Volume II, mostly devoted to hydrodynamics. Thus the topic of singularities in symplectic and contact geometry was chosen only as a "marker" for this volume. There are many articles specifically translated for this volume. They include problems for the Moscow State University alumni conference, papers on magnetic analogues of Newton's and Ivory's theorems, on attraction of dust-like particles, on singularities in variational calculus, on Poisson structures, and others. The volume also contains translations of Arnold's comments to Selected works of H. Weyl and those of A. N. Kolmogorov. Vladimir Arnold was one of the great mathematical scientists of our time. He is famous for both the breadth and the depth of his work. At the same time he is one of the most prolific and outstanding mathematical authors.